The Wet Season plantings are starting earlier this year as the first two plantings can be irrigated if necessary. The third planting, at Tolga, is dependent on prior adequate rainfall. Last year we had good attendance at all the plantings and we hope for a similar turnout this year. School for Field Studies students will arrive at the Centre for Rainforest Studies at the beginning of February, and we hope they will assist with the later, larger plantings. Planting trees is a rewarding experience and newcomers are made welcome and taught how to plant, so bring along friends to enjoy a morning's work and barbecue afterwards. Parking space at plantings is often limited, so please car-pool as much as possible. At the McCaffrey's planting, parking is on one side only of Kenny Road. The Emms' Rock Road planting may require car-pooling into 4WD vehicles from the start of Rock Road. * Planting cancelled due to wet weather. All plantings start at 8.00am. Car-pool as much as possible. A morning tea or barbecue will be provided after all plantings. Can the return of rainforest be accelerated without tree-planting? The first of these two plantings on Ian's property will be funded from a grant of $4000 from Australian Ethical Investments Ltd. and monies from TREAT's Environmental Benefit Fund. The second planting will be funded using a grant from the Queensland Government's Everyone's Environment grants program. Both plantings are extending the width of the final link of the Peterson Creek Wildlife Corridor to the National Park at Lake Eacham. TREAT and QPWS have invested in some new irrigation equipment which can be used if the current dry spell continues. TREAT is also trialling the use of weed gunnel around trees in the first planting, to determine its cost effectiveness in maintenance. Cutler Road is off Lake Barrine Road between the Gillies Highway and Malanda. Look for the TREAT signs. This planting at Winfred Weiss' property is on a Sunday, following Australia Day on the Saturday. It is dependent on sufficient rainfall beforehand, and will not proceed otherwise, as the site will not be irrigated. It is funded through the Australian Government's Reef Rescue program coordinated by Terrain NRM. It is an agro-forestry planting and forms part of a larger plan for Upper Spring Creek to stem the flow of storm water run-off. Stonehouse Road is off Tate Road at Tolga. Look for the planting signs. Jill and Don are planting up the small corner of their property across Maroobi Creek. This will complete their plantings, which started in 1999, immediately after they bought the property. TREAT has assisted with many of the plantings and it has always been rewarding to plant into the well prepared sites and see the excellent maintenance of previous plantings. TREAT held a field day at the property in 2008, and this year, following the planting and morning tea, Jill and Don will host another tour of the property for those interested.Their property is adjacent to the Lakes Corridor linking Lake Barrine and Lake Eacham. Gadgarra Road is off Wright's Creek Road at Lake Eacham. Follow the TREAT signs. Mark and Angela have been planting trees on their Ringtail Crossing Nature Refuge property since 2004. They received funding from the Australian Government's Biodiversity Funding program, and this planting will be east of the 2011 planting, to widen the corridor they're creating from a large remnant patch of forest to the Herberton Range National Park. Kenny Road is off the Malanda - Millaa Millaa road, past Tarzali. Look for the TREAT signs. This planting is part of WTMA's Making Connections project, funded by the Australian Government's CFOC (Caring For Our Country) program. This property of Carolyn and Philip Emms is at the end of Rock Road, and forms part of another wildlife corridor to link the large remnant patch of forest at Upper Barron to the Herberton Range National Park. TREAT assisted with a planting here in 2011 and this year the planting will widen the area adjacent to the National Park. CVA will be assisting TRC with site preparation and will plant 1000 trees during the week. The 2000 trees for the community planting will be sourced from QPWS under an agreement with TKMG. Rock Road is where McKell Road and Kenny Road join at Upper Barron. Follow the TREAT signs. TREAT held a field day at Geraldine and Athy's property 'Oak Grove' in July this year. It was an opportunity to see the changes made to previously cleared land, by revegetation. This planting will add to their revegetation work adjacent to the road, on both sides of their entrance. Old Boonjie Road is off Topaz Road. Follow the TREAT signs. Ken and Sue have this year received funding assistance from the Australian Government's Community Action Grant to TKMG. Last year, planting was around their dam area and this planting will be around a gully area running down to the dam. Four rock weirs have already been installed to slow water run-off and help prevent erosion. Eastern Connection Road is off Powley Road off the Gillies Highway. Look for the TREAT signs. Carolyn and Philip have been planting trees for many years on their Barrine Park Nature Refuge property, adjacent to the National Park at Lake Barrine and to Donaghy's Corridor. They have now bought the next door property, 'Cedarvale', and received funding from the Australian Government's Biodiversity Funding program to revegetate areas there. They have already planted an area around some springs and this planting will increase that area. Pressley Road is off the Gillies Highway near Lake Barrine. Look for the TREAT signs. Can a Sustainable Landscape Rehabilitation Industry Exist? I remember a friend of mine saying to me "you have the bug" and I would suggest the majority of people reading this TREAT newsletter also have the bug. 'What's the bug?' you ask. I think it boils down to an attitude of those people who care about making a change for the better to degraded landscapes, or through sustainable practices, give back to the environment what the environment gives to them (including the pure enjoyment of working outside in nature and the simple fact you sleep better after all that fresh air). After spending half of my life in the desert and seeing firsthand how fragile the Australian landscape is, coupled with my dad planting trees (everyone thought he was crazy) to provide shade for livestock on sheep and cattle stations, I decided long ago to try and help maintain a sustainable landscape. I caught the bug when I was lucky enough to work in a short term employment program at CSIRO in Atherton in the mid 1980s. This is where I met Geoff Tracey and Tony Irvine, who inspired me through their dedication to botany, indigenous understanding and the creation of a landscape rehabilitation industry into the future. When it rains in the tropics, heaps of erosion takes place; also wildlife had been isolated through land clearing. The idea was to mediate the erosion by planting trees in riparian zones while strategically linking forest fragments within the landscape. A good example of this is Donaghy's Corridor, a project led by Nigel Tucker with support from TREAT, WTMA, QPWS and the landholder. They installed a functioning connection between National Parks through grazing country. This did not impact on productive areas for livestock, and provided shade and improved the water quality. I have been working on the Barron Catchment Care's (BCC) Green Corridor project since day one (2005), where their vision was to revegetate the Barron Catchment over a twenty year period. BCC don't employ staff so two host organisations (Conservation Volunteers Australia and Terrain NRM) supported the Green Corridor project by employing the on-ground team to roll out this ambitious project. This arrangement came to an end in April 2012 and to keep the momentum going (and to keep the team employed) my business partner (Alison King) and I formed the company NQ Land Management Services. We have eleven staff who have been working together for the last four years. Our company is committed to promoting and supporting a large indigenous component to the workforce as well as employing experienced locals. Our client base is growing and so far so good. We all struggle to get decision makers to value the environment as it should be, and we still have to submit applications into a lottery to receive assistance to improve degraded landscapes. All the grants and trickle feed financial stimulus directed at healing country still is nowhere near enough of a resource to sustain a landscape rehabilitation industry. Very few opportunities are available in this industry for on-ground workers, given the lack of consistent funding or commitment by entities to give back to the environment what it gives them. Plenty have had a go. For example, when I worked with QPWS in the 1990s we had eighteen staff working out of the Lake Eacham nursery; in the late eighties and early nineties Geoff Tracey and WTMA had created teams throughout the Wet Tropics for timber workers displaced after World Heritage listing (only a few teams left now). Recently I led a team working for Terrain NRM, but due to circumstances this came to an end - it's about sustainability and relying on grants and political will. I don't think too many decision makers understand how Environmental Goods and Services provide the community with what we need to survive e.g. air, water and soil. I am hoping some of those decision makers get the bug so we can finally create a sustainable industry healing country. Recent decades have seen a big shift in the public perception of rainforests - from being overwhelmingly viewed as an obstacle to be cleared for agriculture or felled as a source of timber, to being valued by many and mostly protected from further clearing. It is now also several decades since TREAT members and other dedicated restoration pioneers started to develop tree-planting methods aimed at returning a cover of rainforest to former agricultural land in areas of ecological importance. During that time there have been many successes. These include the development of effective revegetation techniques and the creation of continuous ribbons of restored rainforest stretching across the agricultural landscape, and protecting now-flowing streams that were once degraded bogs. But best-practice high diversity restoration plantings are necessarily intensive and expensive. So this limits the total area of forest that can be restored to a small fraction of that which would be desirable for managing the environment and avoiding the further decline of unique Wet Tropics species, especially in the face of a changing climate. For this reason, a group of collaborating community and management organisations, researchers and landholders came together in 2011 to start looking at novel techniques for restoring rainforest habitats and biodiversity to former pasture land. This has now become a collaborative project. It was stimulated by seed-funding obtained within a Caring for Our Country grant coordinated by the Wet Tropics Management Authority, whose focus was the revegetation of climate-change refugia in the Wet Tropics uplands. The return of forest to areas of previously-established pasture involves overcoming a series of different ecological barriers to regeneration. Two barriers appear especially important. First, many pastures consist of vigorous and aggressive open-country grasses, which are often introduced species. For example signal grass (brachiaria) Urochloa decumbens and Guinea grass Megathyrsus maximus both originate from Africa but are used in tropical pastures worldwide. These grasses grow as dense swards which resist invasion by native rainforest plants. Dense pasture grasses suppress tree seedlings by outcompeting them both above-ground (for light) and below-ground (for water and nutrients). However, if tree seedlings establish and grow to sapling size, then they in turn become capable of out-competing the grass, especially if a closed canopy is formed to shade the soil. Second, the seeds of most rainforest trees and shrubs are relatively short-lived, so that there is little seed storage in soils beneath pasture. Mature trees can provide seed input to pasture areas adjacent to the edge of existing rainforest, but research suggests that such input may be greatly reduced at distances as little as a few tens of metres away. On the other hand, most rainforest trees and shrubs bear fleshy fruits which are designed for dispersal by fruit-eating animals, especially birds and mammals. 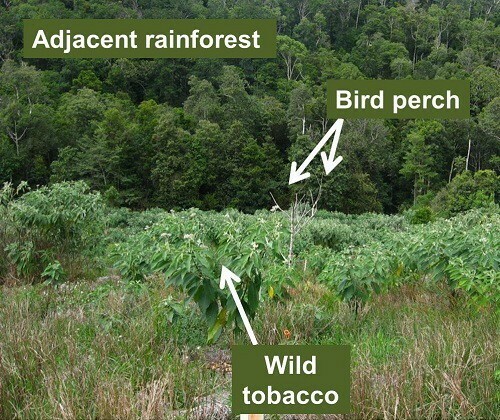 Consequently, the addition of perches as bird-attracting structures has potential to increase the input of seed away from rainforest edges. Furthermore, the presence of scattered trees or shrubs (native or non-native) can greatly increase seed availability and seedling recruitment away from forest edges, both by providing nuclei for input of seeds transported by fruit-eating birds, and by creating shade to suppress grasses and a microclimate that favours seedling establishment. Another challenge to restoring forest ecosystems is the return of fauna to revegetated areas. Research has shown that some rainforest-dependent birds (for example, brown gerygone and black-faced monarch) readily colonise replanted or regenerated areas once a forest-like vegetation structure has developed. However, simply restoring a dense cover of native trees and shrubs may not be enough to reinstate the diversity of the most specialised species (including some important endemics such as the bridled honeyeater, and Victoria's riflebird). Also, the rainforest floor has many large fallen trees and branches (coarse woody debris), providing log habitat which takes a much longer time to develop, but is a critical resource for some animals. For example, the prickly skink Gnypetoscincus queenslandiae is a species confined to Wet Tropics rainforest upland regions and is typically rare in even well-developed replanted sites; outside of remnant rainforest it has only been recorded in old plantations that contain abundant coarse woody debris. Such species may only be able to use revegetated sites if there are specific management interventions to provide the critical habitat features that they need. After some discussion among the project partners, we planned a project to undertake novel forms of on-ground restoration works within two types of experimental plots: (1) pasture conversion - 'kickstart' trials; and (2) microhabitat supplementation - woody debris addition. Below we provide some further information about both approaches, and the emerging outcomes after the first 12 months. The Kickstart trials aim to remove or manipulate selected barriers to regeneration in pasture (especially competition from grasses and input of rainforest seeds), and to monitor regeneration. Each trial centres on a Works Plot, of area 80m X 80m (0.64 ha), with one end directly abutting the edge of a large intact rainforest area. Three different Works Plots have been established. Two were installed on the Cloudland property (Dave Hudson and Robyn Land) in November 2011 and one at Ringtail Crossing (Mark and Angela McCaffrey) commenced in June 2012. To establish each Kickstart Works Plot we apply a series of treatments. First, livestock must be excluded, to prevent grazing of tree seedlings. Second, pasture grasses and some herbaceous weeds are suppressed, using staged repetition of herbicide spray applications. In the first treatment we both sprayed the entire plot and also killed all 'weedy' woody shrubs (native wild raspberry (Rubus) and non-native lantana (Lantana) and wild tobacco (Solanum)) with a combination of spray and stem treatments. 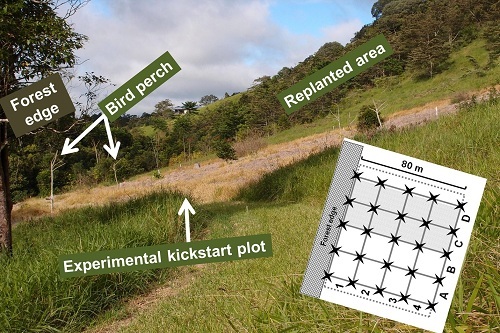 Subsequent treatments are decided separately for each plot, using 'adaptive decision-making' - that is, the plots are regularly inspected to assess the level of new growth of grass or other undesirable ground-covers capable of suppressing rainforest seedlings, and then the nature and timing of each spray depends on the extent to which it is considered necessary (while also aiming to minimise costs). Accordingly, sprays are not needed in winter when growth is slow, and some follow-up sprays have shifted to more use of the grass-selective 'Fusilade' (fluazifop-p butyl) chemical, whereas initial sprays used glyphosate. Apart from the first treatment, fruit-bearing shrubs that both provide cover and attract frugivores are retained (including lantana and tobacco). Each Plot is also subdivided so that outcomes of different types or frequencies of herbicide application can be compared, especially where these involve choices between high or low cost methods. The third type of treatment relates to the importance of seed dispersers and dispersal. To encourage seed-dispersing birds, each plot contains nine bird-attracting structures - perches about 4m high with 3-5 short branches, constructed by cutting sarsaparilla (Alphitonia petrei) trees from other areas. 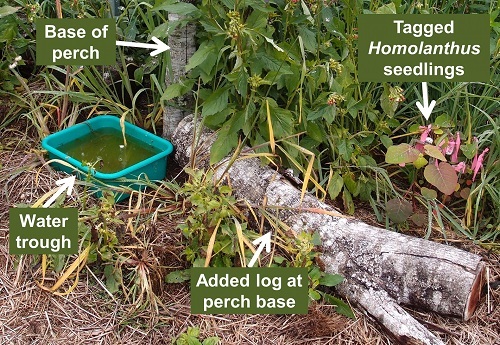 Each perch is coupled with a small plastic water trough which fills from rain. We also mapped the scattered pre-spray locations of both the few regrowth rainforest trees on each plot and the killed lantana and tobacco bushes. So now we can look at whether any of these have more seedlings growing beneath them. And we can also find out the effect of distance on seedling recruitment, since each plot stretches from zero to 80m from the forest edge. The effectiveness of all these treatments is assessed by systematic monitoring. First, a record is kept of all interventions in the Works Plots and their costs. Second, we do a 'condition assessment' (rapid visual assessment and map) of each plot, about three times per year. Third, we measure the vegetation structure (including ground and canopy cover, plant life form and stem sizes, as per Module 4 of the Revegetation Monitoring Toolkit). Fourth, annual seedling searches are under way to map, measure and tag seedlings across selected parts of the Plot, with important input from staff and students of the School for Field Studies. The design also includes Grazed and Ungrazed Control Plots (each 80m X 20m with one end abutting the rainforest edge) to provide baseline reference points for scientific interpretation. So what are the outcomes so far? Although monitoring so far is incomplete, and there have not yet been any quantitative data analyses, some things are easily seen when walking around the Cloudland plots. First, there was a clear and rapid response to the grass suppression, with many woody seedlings germinating and growing in the Works Plots within the first six months of treatment. Close to both the bird perches and the locations of pre-treatment shrubs (whether lantana, tobacco or native species), these forest recruits comprise many bleeding hearts (Homalanthus novoguineensis) as well as other pioneers such as Alphitonia petrei and species of Polyscias. Some of these have reached two metres tall in the first 12 months. This visual pattern confirms the importance of frugivore-attraction in rainforest regeneration. Currawongs are so far the main birds attracted to the perches, and they have been abundantly regurgitating rainforest seeds in and near the water troughs, including some that have not yet been recorded as seedlings (Cryptocarya sp, Elaeocarpus ruminatus, Ficus sp, Myristica globosa) and others that have (Alphitonia petrei, Polyscias elegans, lantana and tobacco). In other parts, most of the woody regrowth has been wild tobacco, which has grown up to 3-4 m, and in some areas has formed clumps which have begun to shade the ground. It seems likely that these tobacco clumps will function to further attract the frugivores and help bring in the rainforest seeds. In other areas, many non-native herbaceous species have germinated, especially thickhead (Crassocephalum crepidioides). The next 12 months are bound to be even more interesting and informative ... especially if the coming wet season brings adequate rainfall. The microhabitat supplementation trials aim to manipulate coarse woody debris within replanted areas in order to investigate whether adding such debris is able to firstly provide a 'log microclimate' within replantings, and secondly attract types of ground-dwelling reptiles and invertebrates (e.g., insects, spiders etc) that would otherwise be largely confined to mature rainforest. Some previous restoration projects have included efforts to incorporate microhabitat features such as logs. However we still lack basic information on the effectiveness of such interventions, what time-lags might be involved, and what factors govern their success. To provide convincing answers to these questions, the microhabitat trials are under way at five different sites, established on three properties between November 2011 and August 2012. Each site contains both an area of replanted rainforest and a large remnant rainforest area located adjacent to each other, and each trial plot straddles a 60m length of the edge between them, extending about 20m into the habitat on either side. At each site we have conducted a series of manipulations of the amount of woody debris. These include adding wood to the replanted areas in the form of some log piles constructed from salvaged logs and other constructed from fence posts, as well as removing wood from sections of the adjacent forest floor. The specific log pile design was carefully considered during the project planning, and aims to create the microhabitat features (e.g., temperature, humidity, availability of small sheltered spaces) of a large decaying rainforest log. Importantly, it may not be the case that 'any old log' can provide the necessary microhabitat. Log piles are achieved by stacking five smaller logs (about 1-1.5m long by 15-25cm diameter) together, in a manner that is both easy to install and can also be easily taken apart in order to survey the reptiles. Outcomes are being monitored by surveys of ground-dwelling reptiles twice each year and pitfall trapping of invertebrates, as well as assessments of the rates of wood decay, and of the ways in which the log piles modify their local microclimates. So far, information from automatic data loggers placed in different parts of these sites, and in the log piles, is indicating that the log piles are able to provide a suitable microclimate. Although only a few reptile surveys have so far being completed, the prickly skink has indeed been recorded from a log pile in a replanted site. However, definitive conclusions await further work. Interesting findings are emerging from these trials, and the greatest return will come from longer-term interventions and follow-up monitoring. Will the amount of rainforest regrowth in the Kickstart plots continue to increase over time? Or will it be suppressed by the invasive plants? Could there be a good time to selectively control the latter to release the rainforest growth? Will the log piles be useful to rainforest fauna? Only time and further experimentation can tell. The development and implementation of the project has been very much dependent on the collaboration between the project partners - Universities (Griffith University, University of Queensland, School for Field Studies), government organisations (Wet Tropics Management Authority, Qld Dept of Environment and Resource Management, Tablelands Regional Council Community Revegetation Unit), non-government organisations (Tree Kangaroo and Mammal Group, Conservation Volunteers Australia) and private landholders (Dave Hudson, Robyn Land, Angela and Mark McCaffrey and Caroline Emms). Current funding for on-ground works and monitoring does not extend beyond 2013 (thanks so far to Caring for Our Country, the National Environmental Research Program, Toshiba and Landcare Australia), although we hope that some further work will be possible. The nursery is full of some really good stock right now, ready for planting following a great spring growing season, with trees available to members on Friday mornings. If you have applied to TREAT for trees in excess of your standard member allocation please advise nursery staff at least one week in advance of your collection date, following confirmation (by letter) that your tree application has been successful. Please note that any nursery trays and pots supplied under this arrangement need to be returned to the nursery for sterilisation and re-use. We will be supplying trees to a number of large projects this season including around 6,000 to TREAT for two plantings in January on Ian Freeman's property as part of TREAT's ongoing Peterson Creek project. Tree Kangaroo and Mammal Group will receive 3,000 trees again this season for planting on three properties around the Evelyn Tableland area, and Barron Catchment Care will also have access to trees for remnant enhancement work under their Mabi Forest enhancement project. Ongoing issues with stray cattle have meant that planned QPWS plantings at Massey Creek are at present on hold. Last year's Massey Creek planting site suffered severe frost damage and the anticipated replanting of this site has been placed on the backburner for this planting season due to the cattle issue. The nursery continues to supply trees for ongoing QPWS revegetation projects at Mossman and Eubenangee Swamp National Parks. Finally, a very Happy New Year to you all from the nursery staff while we await the rainy season so we can start planting trees!